Silly Stories About Sailor Moon! In light of all the ugly incidents from the last week, we had to scrap our plans for our joke post this year – we may post it later after this all blows over! However, we were in luck and found a bunch of silly Sailor Moon related stories to share with you this weekend! A Horse Named Sailor Moon Makes the Move from Germany to the United States! No, Pegasus wasn’t for sale. 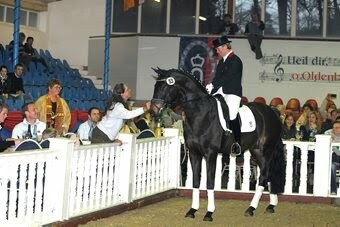 In Germany, just days ago at the 2010 Spring Elite Auction of Oldenburg Sport horses in Vechta, Germany , a beautiful dark bay colored horse named Sailor Moon fetched the highest price. He was sold for a whopping 140,000 Euros (almost $188,500 USD) to the lucky Marta Kaufmann of Los Angeles. The horse will make his way there, and be used in dressage competition. Sailor Moon has some pretty hefty lineage in his pedigree, he is the grandson of Rohdiamant of Oldenberg, Germany, and the son of dressage winner Sandro Hit. We’re not quite sure what inspired the name of this horse as he does not have a crescent moon on his head, and Sailor Moon isn’t a girl, but this was still a silly story to read – Sailor Moon never ceases to pop up in all corners of every day life! The photo we have featured here is from Ov-Online.De and the woman on the left petting the horse is Marta. Fans can check out his page in the auction guide here, and two videos here and here. This is not the only horse in the world named Sailor Moon. A mare, affectionately nicknamed “Moonie”, lives in Australia. Another Celebrity Professes Their Love For Sailor Moon! 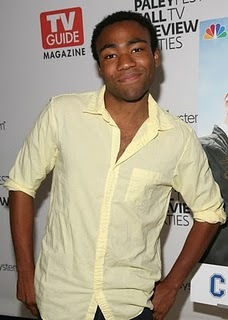 Donald Glover has sure come a long way! Right after he graduated college, he was hired by Tina Fey to be a writer on 30 Rock. Then, he was cast in NBC’s current comedy hit Community as the dim-witted Troy Barnes. On March 19th, his first special aired on Comedy Central. He was asked by AV Club in an interview why he thinks it’s the best time to be a black nerd, and what his nerdiest quality is. In his answer, he gave a surprise answer about Sailor Moon! Also, I was really into Sailor Moon as a kid, so that was pretty nerdy. I loved Sailor Mars. That was my thing. You know that weird teenage thing where you kind of dabble in, “What if you could make a cartoon real? Maybe she could be my girlfriend.” It was sadness. Sadness? How many readers of this blog wish Sailor Mars were their girlfriend? There’s nothing to be ashamed of, Donald! Marine-Style Fashion Popular Once Again in Japan?! The spring and summer fashion season is upon us once again. Do you remember the warm feeling you got wearing a sailor suit or dress as a child? How about that navy blue coat with the gold buttons on each arms paired with a sharp pair of pants with that infamous sailor collar? The navy blue, white, and red color scheme is making a fashion comeback in Japan as we speak – Japanese people still feel the warmth and feel much younger when they wear Marine-Style fashion. This was highlighted just recently for an article in the Mainichi Shimbun, and also had a section talking about sailor suits! The article says that this Marine look is pretty familiar to women in Japan. 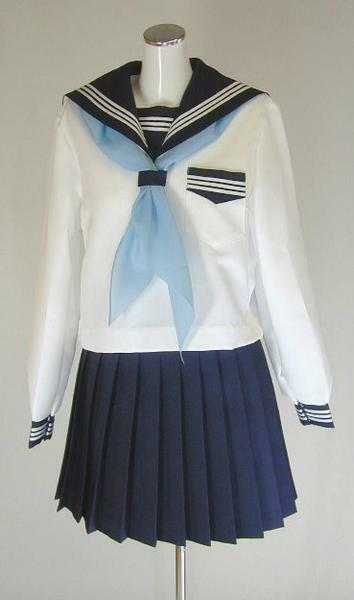 As schoolgirl uniforms, the “sailor suits” or seifuku were introduced in Japan in the 1920s. They were typically thought of as only schoolwear and not playful at all until a certain franchise turned that notion on its head! Sailor Moon took off the sleeves, shortened the skirts a little, and put a spin on the classic uniforms for the Sailor Senshi’s battle attire. This had such an influence on the seifuku culture that when the 2000s rolled around, there were all sorts of variations on the seifuku not just for uniform purposes, but for cosplay as well. We knew Sailor Moon was influential but we had no idea it had such an impact on fashion in Japan! Can You Spot the Dub Music Sighting On Our Forums? Our forums have this neat little arcade feature where members can pit themselves against each other for the top score (but you have to be logged in for your score to count). One of these games is 13 Phobia, a strange game with lots of smiley faces. You play against the computer and pick smiley faces from the group. The player that picks the 13th smiley face loses. Yes, it’s a dumb game… but does anyone recognize the song that plays when the game starts? Here’s a hint (or if you really can’t hear it, here’s a second)! We don’t know if the game developers were fans of Sailor Moon, but what a wonderful coincidence that it’s on our forums!